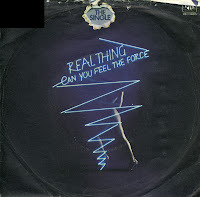 There's something strangely 'Can you feel it'-esque about 'Can you feel the force'. Unlike the Jacksons, Real Thing hails from Liverpool, UK. Members Eddie Amoo, Chris Amoo, Dave Smith and Ray Lake debuted in 1976 with 'You to me are everything'. This single reached number 5 in the UK and number 11 in the Netherlands. It was their last hit in the Netherlands (although a remix of 'You to me are everything' did chart in 1986), but their success continued vigorously in the UK.